Our M50, M52 S50 and S52 E-Dish pistons incorporate features and proprietary designs that others charge premiums for and simply cannot match. Many of our competitors offer pistons "exclusive" to their name and those pistons are often only slightly tweaked, "off-the-shelf" versions from said piston manufacturer with very little thought put into them. This is done to reduce their cost and speed up "development." Our pistons showcase years of knowledge and experience from experts in the Domestic and BMW race fields, making them a truly engineered piston. Some would call our pistons "over engineered," but what's the problem with that?! With features like our "E-dish" design to help direct combustion gases, our pistons are not only strong, they are designed to help control the combustion event which helps improve performance and can reduce the detonation threshold. Other features include a polished pin bore. Many companies simply hone the the pin bore and call it good. It is our attention to detail, all the details like polishing the pin bores that sets our products above the rest. If you simply have to have the best, these pistons have your name on them. Almost ALL brand name pistons available "off the shelf" from competitors use a simple flat dish design. A Flat Dish is the simplest and easiest to manufacture piston style. Next to no thought is required for a flat dish piston. The next best piston design uses a spherical dish design. Pistons with a spherical dish require more thought and design and provide superior combustions control and performance compared to a Flat dish. Spherical dish pistons have a dish that is not flat, but spherical in the sense that if you were to cut a sphere close to the bottom, it would gradually cup and flow to create a "bottom" only in the center, with no flat spots in the dish. 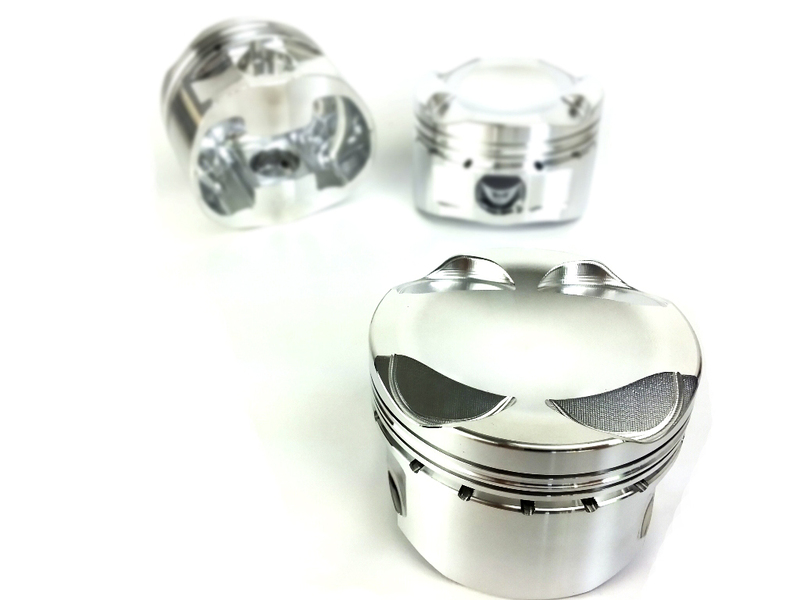 E-dish pistons, at first glance look like spherical dish pistons. However, the most thought and design goes into a spherical dish. The "E" in E-dish, stands for Eccentric, which means,not placed centrally or not having its axis or other part placed centrally. The Dish may be off center, deeper on one side than the other or both. The E-dish is designed to compliment the engines cylinder head combustion chamber and aid in directing the hot gasses to an ideal area of the combustion chamber. This improves the efficiency of the combustion process and also helps to aid in detonation prevention. We want to be clear, these pistons will not PREVENT detonation, part of the design function is to help reduce the risk of detonation.